While I was painting car bumpers from my office window, there was a bumper car incident on Beaver Hall Hill in downtown Montreal. Glad I was painting instead of driving at the time. Oh my! careful what you paint next!!! Perhaps melting snow would be good? Great work, as usual! Thanks Gayle. This wasn’t a surprise snow storm so I have no idea why there was no salt on the roads. Such a steep roadway – and apparently they had not salted in advance of the freezing rain? I grew up driving in Montreal (across the lake from Beaconsfield in the Chateauguay area) but no amount of experience can save you in that situation! You’re right, if you are coming down that steep hill with no salt or sand on the road, there’s no escaping the pile up. At least they were going really slowly so no injuries during all of this. Just a bit of craziness. shape and edge say it all-awesome sketch. Thanks Holly. You are so right about shape and edge. In fact, I wish I would have had some good watercolour paper with me instead of a sketchbook. This would have been so much more interesting with a rougher paper where I can get the snow edges by using a dry brush. You sure do make magic Shari, with these very unmagical scenes! You are very generous with your comments ChesapkLady. Isn’t it? It must have been amazing to be the person taking the video. It doesn’t seem real, does it? Thank you for sharing such inspirational segments of your life looking out the office window. Thank you Bernadette, for appreciating the mundane view from my office window. Thanks Marc. Just brush shapes really, but unlike you I always have to put in a few pencil lines first. I would imagine there would be a little terror as the bus you are on slides down the hill and then gets rear-ended several times. Thanks for writing Soni. I would have found this scene very dull and uninteresting but you turned it into a fascinating play of shadows. Love it. It was a pretty dull day Carolyn. I think I was just lucky to choose this angle from above so it added some perspective into the scene. Thanks for writing! This is wonderful, Shari. I love snow scenes and this is just so different from any other. Always amazed by your work. thanks Judy. 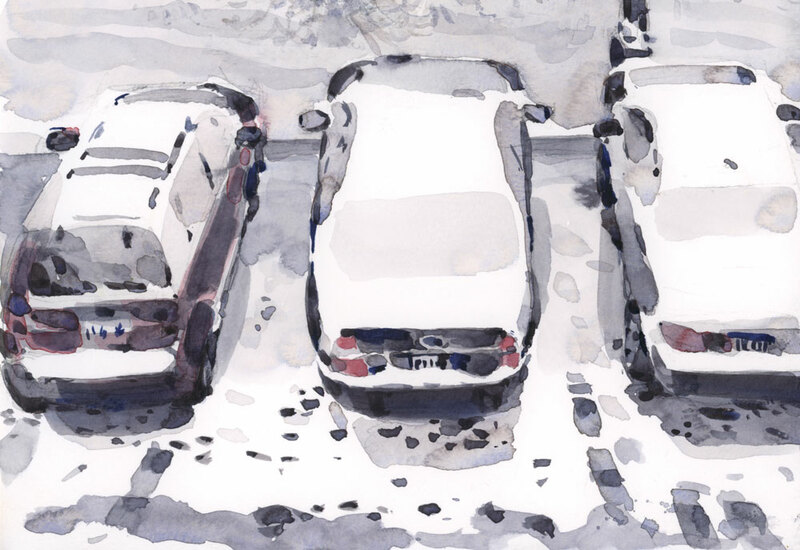 It’s a pretty dirty snow scene but I haven’t had a chance to paint on a sunny winter day yet. Just lots of slush so far. what a fresh new way to look at snow! I love those rear windows especially that the car on the left has less snow on it’s window. beautifully observed and captured. Thanks Suhita. If ever you want to paint snow with me, just let me know! one day i’ll work up the courage, Shari! This watercolor sketch made me smile. I especially like the footprints and tracks. Such an ordinary scene – maybe that’s what gives the sketch it’s charm.